Kemtile is the world's longest established licensed applicator of BASF's Ucrete, the number one leading brand of seamless polyuurethane flooring used within chemical, pharmaceutical, and food manufacturing facilities world-wide. Kemtile site operatives and supervisors are product-trained and technically-assisted on site by BASF Construction Chemicals. Ucrete was designed and developed by ICI Chemicals more than 35 years ago to be installed within their chemical, pharmaceutical and food manufacturing facilities to protect concrete floors from their inert weaknesses. Today, throughout the world, Ucrete is the number one leading brand and product of choice for clients and specifiers in these industries. Ucrete has unique properties. The polyurethane screeds are moisture tolerant and can be installed onto three-day-old polymer concrete screeds and seven-day-old concrete, allowing tight installation programmes to be achieved. Ucrete is resistant to a wide range of process and cleaning chemicals, such as acetic acid, lactic acid, oleic acid, citric acid and sodium hydroxide. It is readily available in a range of smooth and slip resistant textured finishes to minimise the risk accidents in the workplace. Ucrete UD200 can be installed at 6 to 9mm and 12mm thicknesses depending on traffic and environment requirements. It is widely installed in food and drinks process facilities due to non-taint during its application in live-process facilities, making it a safe choice for weekend and maintenance work. At 12mm thickness, Ucrete UD200 is resistant to 150 degrees of thermal shock. The use of a calcined flint aggregate enables the surface texture to be maintained for periods in excess of 10 years. 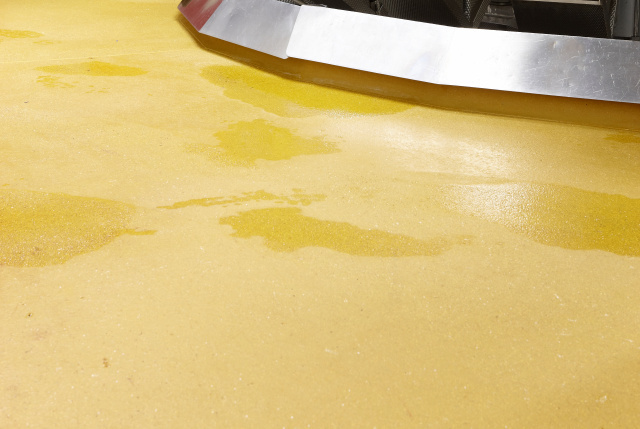 Ucrete UD200/SR offers the same benefits of Ucrete UD200 but provides a high textured profile which minimises slips when liquid spillages occur on the surface. It is also suitable in greasy or fatty environments and provides a surface coefficient of friction of 50-60 in the wet when tested by the TRRL pendulum method. Ucrete MT has a medium duty textured finish and can be installed at 4mm and 6 mm thicknesses making it ideal for use in less arduous environments such as packing areas or engineering workshops. Mastertop polyurethane screed uses the same unique chemistry as the other BASF polyurethane screed systems. Installed at 6-9mm thickness it provides a cost effective alternative to budget systems in today's marketplace. Its unique benefits and features outweigh those of its competitors and is available in a range of colours. 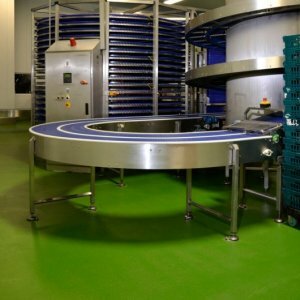 Ucrete HPQ is available in a wide range of standard colours, and the use of epoxy coated coloured quartz aggregates scattered into the wet polyurethane base coat provides a decorative and slip resistant finish. It can be installed at 4mm and 6mm thicknesses, depending on the environment and use. The polyurethane technology enables the system to be applied to early aged concrete and does not have unpleasant odours associated with MMA systems. Ucrete MF and Ucrete MF/AS are installed at 4mm and 6mm thicknesses and has a smooth surface which is ideal in dry areas where ease of cleaning and durability are a requirement. Ucrete MF/AS has been designed to control static electricity in aggressive solvent environments, and where there is a risk of explosion, and conforms to test methods EN1081/DIN VDE 0100-610. Ucrete DP is a suite of products providing defined, consistent surface profiles with three different surface textures DP10, DP20 and DP30 which satisfy the level of slip resistance in a variety of industries and may be installed at 4mm, 6mm and 9mm thicknesses. Ucrete DP is dense, impervious and resistant to a wide range of chemicals. 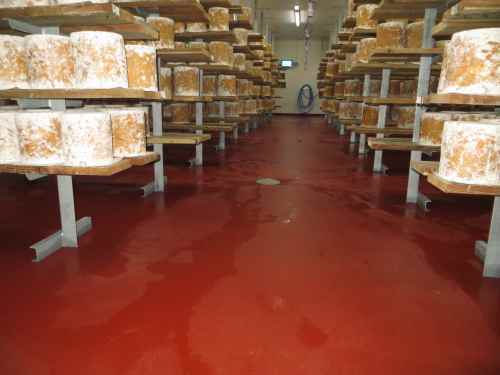 All grades conform to HSE Food Document No 22 [slips and trips]. Ucrete DP10/AS has been designed to control static electricity and conforms to EN1081. Ucrete Fast allows floor repairs and large refurbishments to be carried out quickly, allowing floors to be returned back to service at minimal cost, and with the least amount of disruption and down time. This system allows floors to be returned to service in as little as five hours at 10°C. The moisture tolerant Ucrete chemistry allows difficult to dry wet areas to be accommodated, and being non-tainting allows neighbouring production processes to continue uninterrupted. Ucrete IF is a polyurethane concrete resin screed with metal aggregates and is installed at 9-12mm thickness or greater. The thickness is determined by the specific environment, especially the severity of abrasion and impact. It is suitable for floors subject to heavy traffic, continuous wear such as loading docks, heavy maintenance or engineering facilities,where steel wheeled vehicles are used, such as, in front of rack ovens in bakeries or waste transfer stations.